My brother found this at my parents’ house the other day. 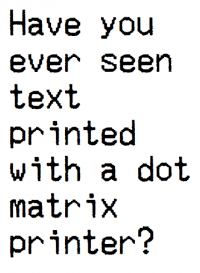 First off, for those of you who are wondering, it’s perforated printer paper. The holes (originally on both sides) are grabbed by the printer’s tractor cogs that pull the paper in to be typed on. The perforations enabled you to remove the hole strips and divide the conveyor of paper into 8 1/2 by 11 sheets. 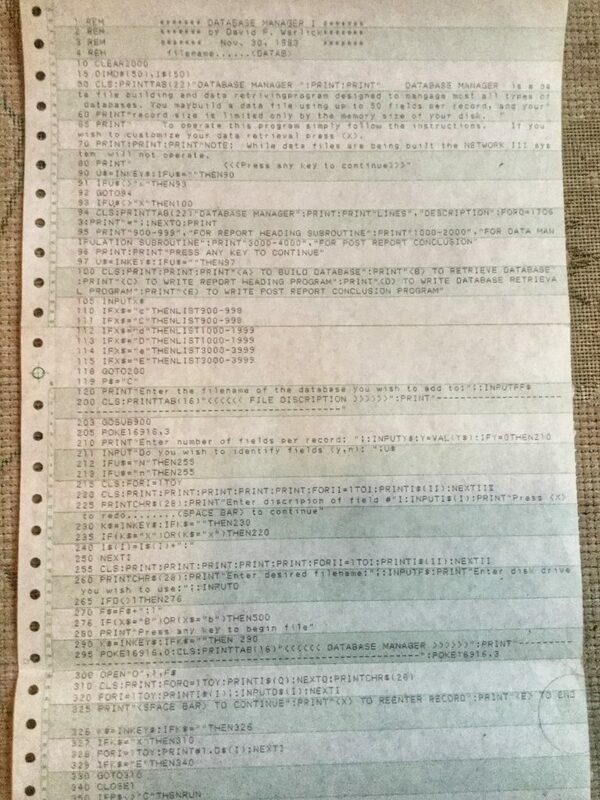 Since computers mostly delt with columns and rows of data back then, the green stripes made reading them easier. But what I’m excited about is what’s printed on the paper, a computer program that I wrote in 1983, when I was still teaching Social Studies in South Carolina. 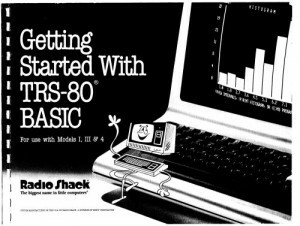 The program is a database application for our TRS-80 (Radio Shack) computers. It enabled students to create datasets for the counties of SC or states of the U.S., or animals by phylum and genus, and then run analyses on them. I wish that I could find printouts of some of my games. 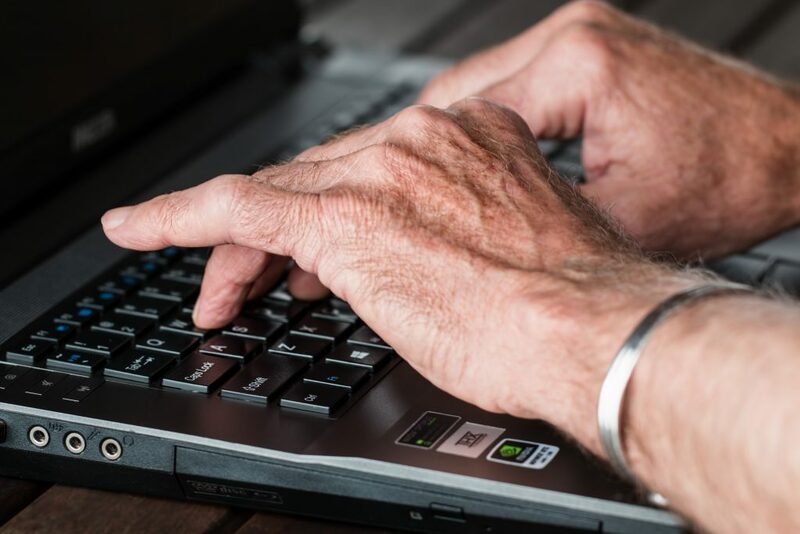 It was such an exciting time when we were free to push the technology, writing and adapting software to support new ideas about learning, because no one else knew what we were doing. It was just computers. I had a conversation yesterday with my neighbor, Paul Gilster, of Centauri Dreams. He comes over about every other week and we talk about our histories, families, space and tech stuff, and it often erupts into some pretty insightful observations – if only to us. But we both agreed that as we are getting older, our learning has actually increasing rather dramatically. Of course, we are also forgetting a lot more as well. But one of the truisms I’ve concluded from a career of learning and teaching is that something learned and used once, can easily be relearned, growing our life long toolset. I saw my first personal computer in 1981. At that time, the closest you could come to a computer store (where I lived) was a back corner of the local Radio Shack store. 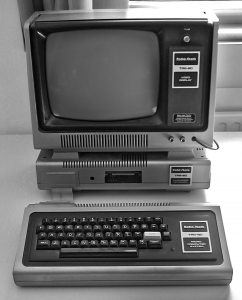 There you found models of their TRS-80 computers, offering all manner of unimagined possibilities – but almost no software. Ready to buy and load (via audio cassettes) were a basic word processor (Scriptsit), a spreadsheet program (Visicalc) and a handful of games, including Galxian, Asteroids, Targ and Zork. Unsurprisingly, we had to go to print in order to learn and a few early magazines was the bast place to go. Even then, the gestation time of new books was way to long to be reliably up-to-date. 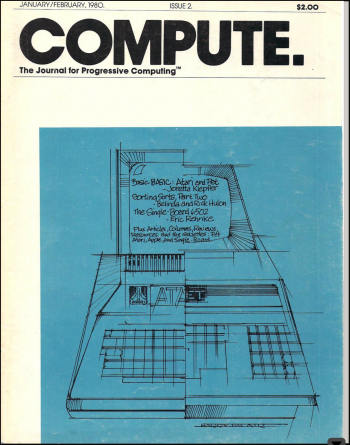 New issues of zines were frequent and regular, and among them were BYTE, PC, Compute and even Family Computing. We learned the latest that was known about these early TRS-80, Atari, Apple and Commodore computers. 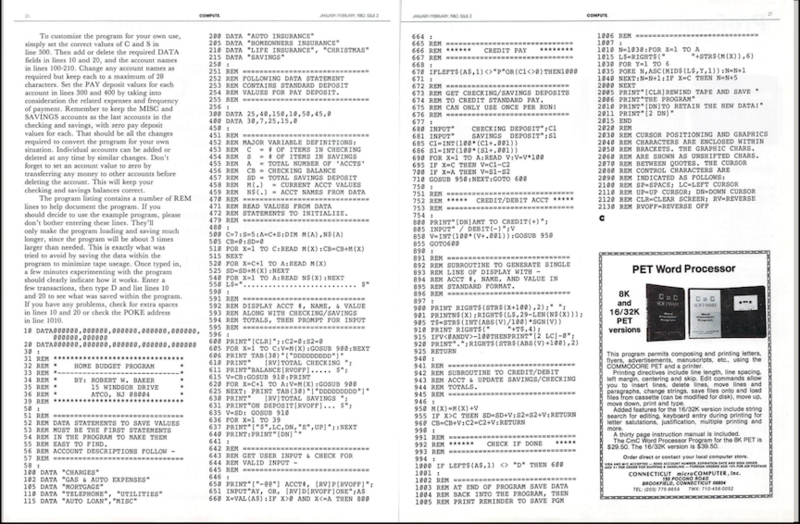 But better, was the programming tips we could learn by typing code that was included on the zines’ pages. Of course, the programs never worked the first time. It was impossible to key the code in without mistakes. So we spent as much time going back and decoding the programs, OR we taught ourselves how to write our own programs. My chapter titles are a bit cryptic, so I am adding some explanation to better anchor the reference points. I admit that there are some biases in my book. What’s a revolution without biases. 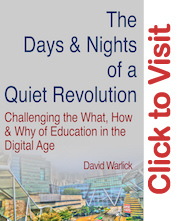 To provide some context for my particular philosophies about schooling, I spend about 19 pages describing my pre-(technological)revolution education, including my less than spectacular career as a student. TRS-80 Model III, the first personal computer I ever laid my eyes (and hands) on. Here, I describe my first experiences with personal computers, starting with how I was knocked out of my seat by an idea. In 1983, I moved from teaching Social Studies in rural South Carolina to leading an instructional technology program in rural North Carolina. I also joined a users’ group (MICRO5) and transitioned from monochrome Tandys to color Apples – dazzling. My first experiences with modems and learning to use computers to communicate. Project based learning (PBL) became our modus operandi – using computers for collaborative learning. Moving to the North Carolina Department of Public Instruction I learned what a small team of passionate and imaginative professional educators could accomplish. I also learned how little could be accomplished from inside the system. I have to note here that what hindered us was not the nature of state government, but the nature of state politics, and a manipulative narrative that sought to demonize government. After leaving NCDPI, I lucked into a project instigated by Allan Weis and Advanced Network and Services. It was called ThinkQuest and it showed us how we could make students active learners by making them innovative teachers. I was so embarrassingly naive on my first trip to Asia. Our work toward using technology to encourage more progressive styles of learning ground to a halt on January 8, 2002. No Child Left Behind successfully shifted the aim of public education from active learning by doing, to passive learning by memorizing facts to pass tests. Computers became teaching tools instead of learning tools. This became my most passionate mission, promoting a model for literacy that addressed the changing nature of our information experience. As information became increasingly networked, digital and abundant (and social), merely reading and writing (and arithmetic) were no longer nearly enough to be truly literate. As video games became more sophisticated and social networks became places that our students visited and collaborated, we started to recognize the unique skills that they were developing – that much of their play was actually the hard work of learning. We began to look for ways to structure classroom activities to trigger the same learning practices that our students were gaining outside of education. As technology became more prevalent in our schools, investors saw a “golden moment.” There was an opportunity to use that technology to “profit by taking over broad swaths of public education.” This has become, in my opinion, the greatest threat that public education has ever faced. I end with a few pages of casual predictions of where education might be ten years from now (2014, when I started writing this book). This chapter mirrors the first chapter that I wrote in Redefining Literacy, describing education ten years from then, 2014. Without any software for my 11 TRS-80 computers, I set out teaching myself how to program them myself. Fairly quickly, I found myself on my knees thanking every Algebra teachers I had ever had. There was finally a purpose for what had seemed to me like purposeless form of mathematics. The BASIC programming book that came with the early TRS-80 computers. You see, I instructed the computer with numbers and mathematics was the language. 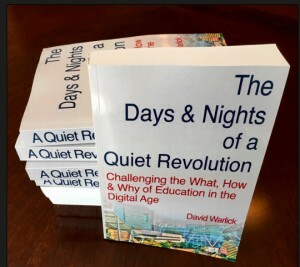 I will be producing little 2-minute videos over the next few weeks to promote my new book, The Days and Nights of a Quiet Revolution. This first one sets some context. When I was in high school, computers were giant machines that were installed with forklifts. My father use to take me to his work, a trucking company, to show me their Honeywell computers. Even after I graduated from college, computers had nothing to do with education. I had no reason to believe that teaching would be changing in any substantial way over my assumed 30 years as a history teacher. 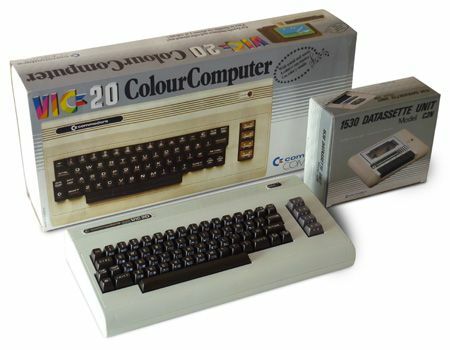 This was my first computer, a Commodore VIC-20. It had 3.5 KB of memory. That’s 18 million times less memory than the iPad I’m typing this on now. I used a cassette player to store programs on tapes. One of the programs I wrote helped me with cooking. I would get home in the afternoon from teaching a couple of hours my wife’s accounting job. So I would select the dish I wanted to cook and the time that I wanted to serve it. The program would list the ingredients, which I gathered, measured and chopped. Then each time an action was required in the preparation the computer would buzz and I would do it, and then get back to grading papers. When my wife got home, our chili, stuffed peppers, vegetable soup or Mac & cheese with tomatoes and sweet peppers was done and on the table. I’m sitting here with my first stack of books for giveaway and thinking about why I called it, The Days & Nights of a Quiet Revolution. There’s nothing in it about education or even technology. I admit that many if not most of the participants in my workshops and audiences of my talks walked away thinking that it was about technology in education. That’s my failing. Educators, perhaps more than most professionals, are hyper focused on methodology of their job. When you have 20 to 40 students in your classroom, some of whom might be just as focused in disrupting your methods, big picture is a sky away from your notice. I, on the other hand, spent my 40+ in education as a classroom teacher, a district administrator, part of a state-wide support staff and a parent. This gave me a unique perspective that encompassed both the day-to-day of classroom instruction, and the larger concerns of the why of education. To be sure, it has not been a technology revolution, an idea that was difficult to convey to practicing teachers. I would stand in front of my audience and illustrate some technique that empowers learning by demonstrating a trick with my computer. Teachers, whose computers had been dumping into their classrooms and told to “integrate technology,” would see me demonstrating technology. The fact is that I was talking about a different way of education, one that goes back to Socrates and more recent education philosophers (Jean Piaget & John Dewey) – required reading for all practicing teachers. It’s an education that empowers students to become fearless and resourceful learners. What better thing for students to become in a time of rapid change, but fearless and resourceful learners. There were many of us mapping out new modes of teaching and learning with these new tools, and sharing them widely – and mostly, we did it during the days and nights of our own time. The index of my book includes a pretty good representation of their ranks, though not nearly complete. We were disrupters, and many teachers resisted our disruptive ideas, as they thwarted disruptive behavior in their classes. They resisted giving their students access to computers and the internet because they felt a loss of instructional control in their classrooms. But many times I watched the most resistant teachers become the most creative users and enthusiastic advocates when they realized the potentials of technology as a flexible learning tool. The greatest and most persistent force against our quiet revelation was not resistant teachers. It was a vision for computerized education held by an emerging education industrial complex. They were companies that saw the computer as a tool to better administer instruction on students, and they saw a market for products that could do that. Before 1990, companies were selling packaged technology solutions that included columns and rows of computers, equipped with software that drilled students in math and language arts, and required procedures, from which teachers were told not to deviate. All students were marched into and out of the computer room, regardless of their need or learning style. It irritated the kids, frustrated the teachers and disappointed administrators when they found that the rapid gains shown by the product were always short lived. That was the late 1980s. Attempts to turn our classrooms into a marketplace and our children into compliant vessels continues, helped along by government legislation. Most practicing teachers have never taught in a school without computers. Yet it was only a few years ago that the earliest machines started to appear in a few classrooms. These scattered Atari, Radio Shack and commodore computers were barely noticed by most educators. A few, however, recognized these rudimentary data processors for what they represented, machines with which we could program new interactive learning experiences that would turn our students into explorers and discoverers of knowledge. For us, education was no longer limited by what could be taught, but liberated by what could be learned. These education revolutionaries set about embracing the emerging computer and network technologies, experimenting, discovering, inventing and sharing wondrous new ways to ignite learning. We were empowering our students to act as agents of their own educations and helping them to cultivate the learning-lifestyles that will be critical in their rapidly changing futures. This story is about thirty-five years of disruptive new technologies that challenged education, an institution that, by design, resists change. It also celebrates the heroes who passionately sought to understand these new technologies and use them to promote schools that empowered learning, instead of administering it. David Warlick has been a classroom teacher, district administrator and staff consultant for the North Carolina State Department of Public Instruction. Since 1995 he has worked as an independent provocateur, developing popular interactive websites, writing for magazines and journals, and authoring four books and an influential blog. He has also traveled and spoken to audiences on five continents promoting a vision of education that empowers learning with contemporary information technologies. Senior teacher technologists who would like to remember those giddy years gone by when we used MECC software on 5 1/4” floppy disks, bulletin board systems (BBS) to collaborate, and Gopher and Mosaic for surfing the Internet. Practicing teachers eager to enrich their knowledge about technology by visiting a time when creativity and resourcefulness were key to hacking rudimentary computers into inspired learning experiences. School leaders who want to better understand the forces from within and without that seek to keep, unchanged, the How, What and Why of public education.